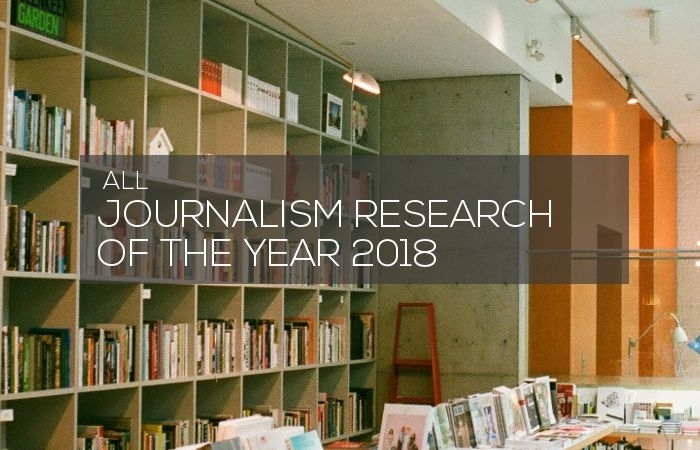 A list of all the peer-reviewed journal articles, reports and other papers collected by Journalism Research News during the year 2018. Some titles might be missing from summer-fall, let us know if an article is not in the list. You can filter or arrange the table per your preference. See a list of the journals we follow. 2018-01-09 Bad Neighborhoods in a Good City? 2018-01-10 More of the Same or a Different Breed Altogether? 2018-01-12 This Reporter is so Ugly, How can She Appear on TV? 2018-01-16 Mobile Journalism as Lifestyle Journalism? 2018-01-23 Are we teaching trauma? 2018-02-02 Does It Matter Who Communicates? 2018-02-21 Are Americans really okay with torture? 2018-03-08 The risks of practicing journalism in Mexico. 2018-03-22 Who Takes the Lead? 2018-05-01 The Issue Takes It All? 2018-05-10 How Does the Audience Respond to Constructive Journalism? 2018-07-10 Nothing But the Facts? 2018-07-12 Transparency to the Rescue? 2018-07-24 What Determines a Journalist’s Popularity on Twitter? 2018-08-16 Simply Bells and Whistles? 2018-09-17 Where Did You Get That Story? 2018-09-19 Is “Global Journalism” Truly Global?